Sarnia, Ontario, April 4, 2011 --- Intertec has launched an explosion-proof smart programmable controller for precision temperature regulation of process instrumentation and analyzer enclosures in hazardous environments. Suitable for use with any explosion-proof electric heater from Intertec's extensive range of compatible heaters, the new generation Smart Controller 2.0 brings exceptional flexibility to thermal management. Advanced facilities include fieldbus networking, extensive monitoring and diagnostic routines, programmable temperature ramping, data logging, and temperature monitoring with user-definable limits. The controller has a switching capacity of up to 10 A, enabling it to be used with explosion-proof heaters with power ratings as high as 2,300 W, depending on the ambient and required enclosure/equipment temperatures and the heater supply voltage. Heater systems based on Smart Controller 2.0 may be used to control the temperature of equipment or the surrounding air in an enclosure or cabinet very accurately, and are especially suitable for use with analytical instruments that need to be maintained at high temperatures and are located in hazardous environments. Typical applications include analyzers handling difficult media in oil, gas and petrochemical processing plants. When used in conjunction with an Intertec CP xxxTHERM HI explosion-proof heater, the controller provides an all-in-one solution that does not require separate safety certification. The complete controller/heater system is fully approved to international explosion proof standards including ATEX, IEC, CSA C/US and GOST. Intertec's range of THERM HI explosion-proof electric heaters includes both finned and block styles, for convection air heating or direct equipment heating by conduction, and covers output power levels from 60 W to 500 W. As standard, they are available with a choice of 120 V or 230 V input, and are also CSA C/US approved for 277 V.
The new digital PID (proportional-integral-derivative) controller provides a very high level of accuracy and functionality. Operating as a remote terminal unit (RTU), it uses the Modbus RTU communications protocol over an RS485 serial network to facilitate easy integration with existing process control systems. As many as 31 controllers can be set up and monitored in one branch of a network. Intertec has created a new suite of PC software and LabView VI drivers that enable a wide set of attributes to be programmed, including the controller's P and I terms, a user-defined ramp for temperature increase against time, and the heater's temperature limit. The software also features a very easy-to-use data logging function, which provides a graphical record of temperature values retrieved over time from each controller. Additional facilities allow the controller to be used as a temperature monitor, to provide a digital output when the temperature is within a user-defined range; this could be used to control a cooling fan for example. Housed in an aluminum enclosure the smart controller has an IP66 protection rating and all external surfaces have a saltwater resistant finish. The PID controller and all associated electronics are fully encapsulated in silicone, with the Ex e electrical terminals freely accessible in a separate compartment. Power to the heater element is handled by a fully proportional, triac-based control circuit, which uses zero-voltage switching to maximize efficiency and minimize EMI (electromagnetic interference). There are two versions of controller: the standard version features a compact housing measuring just 57 x 125 x 80 mm (2.2 x 5 x 3.1 inches) and is suitable for IEC-Ex and ATEX Zone 1, 2 , 21 and 22 . When installed in a NEMA 4X rated enclosure, the system is also approved for use in North American hazardous environments rated Zone 1 or 2, Group IIC or Class I or II, Division 2, Group A, B, C and D. The second version, developed for the North American market, is designed to form part of a cable conduit system, and is approved for Class I, Division 1 rated hazardous environments. The smart controller incorporates three temperature sensors; one is integrated in the controller housing, for measuring local cabinet temperature, and another is embedded in the heater itself, together with a temperature-sensitive fuse, to ensure that its surface temperature can never exceed the specified 'T' rating. Intertec heaters are available for T3, T4 and even T6 temperature classes, limiting heater surfaces to 150, 90 or 50 degrees Celsius respectively. 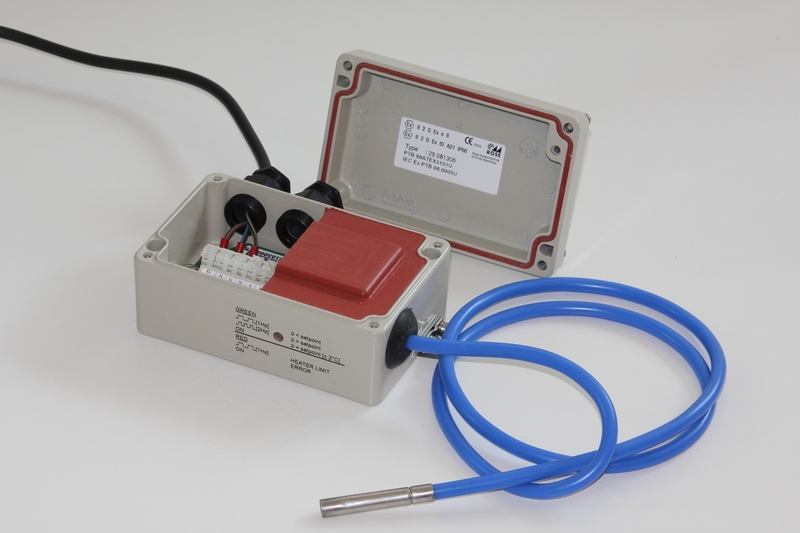 The third is an intrinsically safe KTY silicon temperature sensor mounted at the end of a cable, which can be freely positioned in the instrument enclosure or embedded in the equipment that has to be kept at a constant temperature. The standard version of the controller features a built-in bi-color LED indicator which provides a useful local diagnostic aid by showing any deviation from the set point temperature and highlighting the occurrence of any heater error. Intertec can supply the smart controller and the customer's chosen heater as a complete package. The controller is delivered ready to install, adapted to the heater, and pre-programmed with the customer's choice of parameter default values, including temperature set point, heating temperature class, RS485 address, and line voltage and frequency. In addition to the PC-based software, an optional USB to RS485 interface converter is also available. As well as providing heating solutions for plant engineers assembling their own field-based process instrumentation systems, Intertec is able to supply complete, turnkey instrumentation systems with process instruments, manifolds, tubing etc - pre-assembled into a cabinet or enclosure and ready for hook-up on site. Intertec offers the broadest portfolio of enclosure, cabinet and shelter solutions for protecting field instrumentation in the world. The range includes GRP enclosures and protective shades in a range of shapes and sizes, GRP cabinets and shelters for use in almost any climate or weather conditions, accessories including heating systems, and custom design and turnkey system assembly services. Intertec supplies most of the world's major oil, gas, petrochemical and chemical organizations, from its network of manufacturing and sales offices worldwide, and via a large network of agents and distributors. To date, Intertec has supplied well over half a million protection systems worldwide. Intertec's new explosion-proof Smart Controller 2.0 provides programmable precision temperature regulation of process instrumentation and analyzer enclosures in hazardous environments.